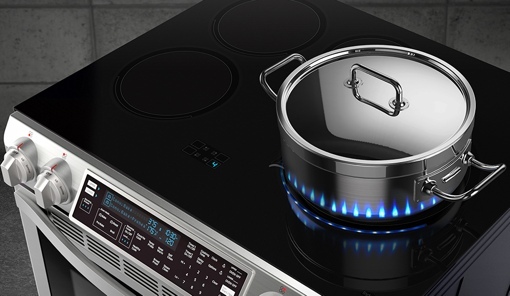 There’s a lot to like about induction cooktops, the kitchen stoves that heat using magnetism, instead of using gas or electricity. Not only do they cook food quickly, they’re incredibly energy efficient. Induction cooktops are also good for families with small kids, since the stove surface itself never heats up – just the pots and pans do. And since induction cooking surfaces are flat, they’re incredibly easy to clean up. The only downside seems to be that induction ranges lack visual cues while cooking – or, at least, they used to until now. Today, Samsung introduced its brushed steel Samsung Chef Collection Slide-In Induction Range with Virutal Flame Technology (NE58H9970WS), a massive 5.8 cubic foot appliance that uses embedded LED lights to mimic a cooking flame when in use. Turn the cooktop on low, and it’ll give give off a gentle blue simulated flame; turn it up to the max and the fake fire gets more intense. The LEDs don’t do any cooking, but they do make cooking more intuitive – a great feature. Clean up of the black ceramic glass cooktop is a breeze, too. The oven half of the range has been expertly designed as well. Flex Duo technology allows you to split the single oven into two sections – 2.6 cu. ft. and 3.1 cu. ft. – with the use of a Smart Divider. You can then choose individual cooking times and temperature settings (fluctuations are held to 8°F) for each. And because there’s no aroma transfer, you can cook a garlic-heavy Italian dish at the same time you’re baking a cheesecake. Without a doubt, the Samsung Chef Collection Slide-In Induction Range with Virtual Flame Technology looks gorgeous, futuristic and would make a great eye-catching feature in a redone, contemporary-style kitchen. The only catch here is the price: This high-end range will set you back $3,699. That’s more than most residential ranges you can find at a Home Depot, but still a decent cost savings over a commercial-style range from Viking or Wolf. You can learn more about the appliance by visiting the Samsung website. UPDATE 5/27/16: Best Buy is currently offering $700 off the Samsung Chef Collection Slide-in Induction Range.